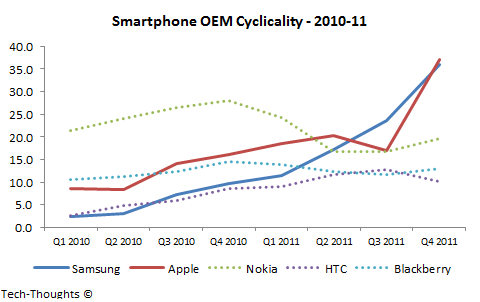 In 2010, the smartphone market was still in its early days and numerous OEMs seemed to be fighting on equal footing (at least based on the figures). 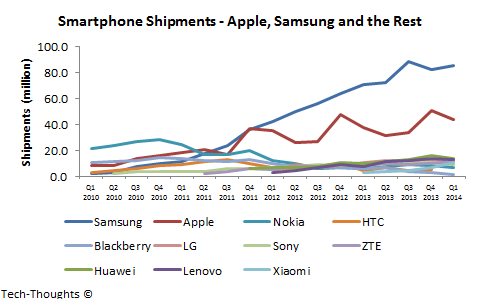 But in 2011, Apple and Samsung broke free from the crowd and have dominated OEM shipments ever since. One of the interesting patterns to note is the lack of cyclicality in their early sales/shipment performance compared to the rest of the market. The lack of cyclicality is usually driven by a couple of factors -- (1) A rapidly growing market, (2) Product and business model superiority relative to the basis of competition prevalent in the market, and (3) Expanding geographical reach. It seems that rapid sequential sales growth with minimal cyclicality seems to be a good indicator of future performance. How does Xiaomi fit with this pattern? 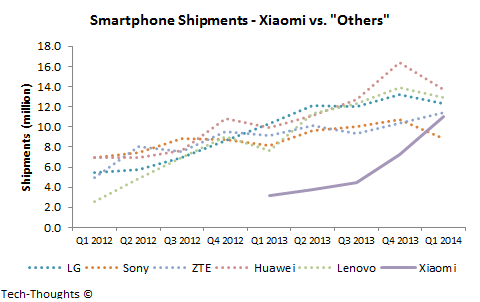 While Xiaomi's scale is still far below the two largest manufacturers, its performance vs. other smartphone manufacturers shows a similar pattern. While other OEMs have seen cyclical dips because of a highly competitive marketplace, Xiaomi's growth has been quite linear. I suspect that the drivers are similar as well -- (1) Xiaomi seems to be targeting fast growing smartphone markets, (2) Their products and business model fit perfectly with the basis of competition in the market, and (3) Xiaomi is rapidly expanding into similar high-growth markets. Another year's worth of data certainly probably help us understand this pattern better, but so far Xiaomi looks to be in good shape.